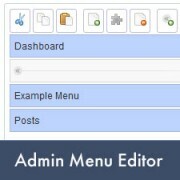 Did you ever wish that you can edit a WordPress admin menu? Maybe hide the admin menu for specific users? 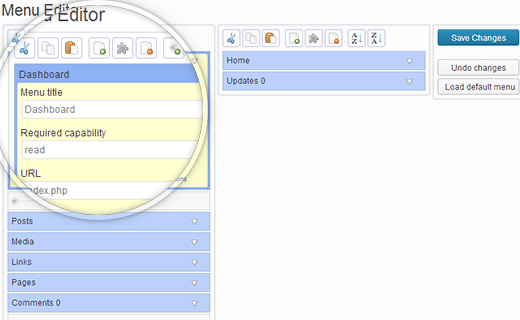 or even add a custom admin menu in your WordPress dashboard? Well you are in luck. In this article we will show you how to customize your WordPress admin menus for users based on their roles and capabilities by using a drag and drop interface. This can be particularly useful if you are running a multi-author blog, and don’t have developer skills to remove menu items with code. First thing you need to do is install and activate Admin Menu Editor plugin. Once you have activated the plugin, go to Settings » Menu Editor. 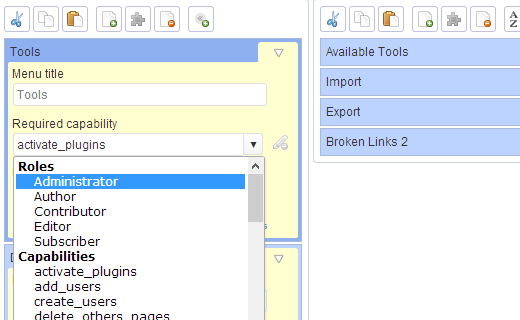 On the menu editor page you can simply drag and drop menu items to arrange them. Clicking on a menu item will display the sub-menu items in the next column. If you click on the individual menu item, then you will see options for that specific item. To remove a menu item click on it to select it, and then click the delete button at the top. If you try to delete any of the default menus, then they will reappear after saving. This by design to prevent deletion of default menus. Best practice would be to hide the menu for specific user roles. You can adjust who sees a menu item by by choosing required capability. You can either restrict visibility by user role, or by capability. For example, you can hide comments menu from users with the user role of editor. We hope that you find WordPress admin menu editor helpful in adding, editing, and hiding WordPress admin menus. If you have any questions or feedback, then please leave a comment below. Once again, wpbeginner comes through! What a fantastic resource. Such a huge amount of material to keep up to date. Thanks so much. Thank you! I just installed a plugin that I’ll use only once (Login Page Styler) but it places a glaring menu item on the dashboard. Admin Menu Editor allowed me to hide it. Wonderful! How can i move this menus, and don’t broke my WC ? Hi, I want to hide certain sections from a specific user or users, not based on roles. For instance, a client will want maximum control, but won’t really need it. In that case, they are set to admin, too, but I am also an admin. How do I hide certain sections just from certain usernames/people instead of by role?